More often than not, you are required to steep about a teaspoon of the herb of your choice for every cup of water for 10-15 minutes. To improve the taste, you may add lemon juice and honey in the solution. Besides, you can inhale these herbal infusions to derive aromatherapy benefits. Chamomile: It serves as a great relaxant and works as a natural sedative. Chamomile soothes inflamed mucus membranes and relieves insomnia and anxiety. In addition, you can apply frozen chamomile tea bags as compresses to treat skin irritation and reduce puffiness in eyes. 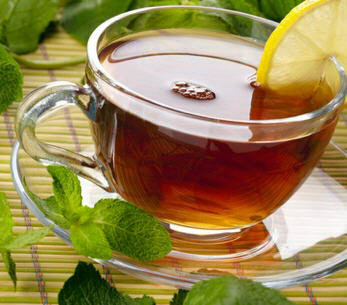 Peppermint: This herbal tea has a nice and refreshing taste. Moreover, it helps you remain alert and focused. It has antiviral, antimicrobial, decongestant, and anti-spasmodic qualities. Hence, curing headache, stomach upset, nausea, heartburn, intestinal gas, flatulence, baby colic, sinus problems, irritable bowel syndrome, and menstrual cramps are some of the most common benefits of drinking peppermint tea. Being an effective muscle relaxant, it is considered as a wonderful home remedy to relieve stress. In addition, it can help you get rid of bad breath. Ginger root: Ginger tea is highly beneficial for getting rid of nausea. Pregnant women can take the solution as a natural remedy for morning sickness. Furthermore, it is useful when dealing with migraine headaches. Besides, it heals problems like common cold, flu, sore throat, indigestion, flatulence, diarrhea, arthritis pain, asthma, bad breath, and so on. Dandelion: Dandelion tea has a nice, sweet taste. Moreover, it is considered good for health because it purifies blood, cleanses the system, stimulates bile production and contributes in weight loss. It boosts immunity, avoids age-related memory loss, relieves bloating, cures constipation, reduces anemia, prevents kidney stones, and reduces inflammation associated with diseases like arthritis, rheumatism, and gall bladder problems. Lemon balm: It calms your nerves, soothes nerve pain, strengthens the memory, and improves your mood. In fact, combination of this herb along with valerian is effective in healing anxiety, stress, and sleeping disorders. It can be combined with Bugleweed to help cure grave’s disease. Besides, you can apply lemon balm infusion on your skin to treat cold sores and herpes outbreaks. Green tea: This is the most popular herbal tea that comes from the leaves of the Camellia sinensis plant. It lowers cholesterol, boosts immunity, fights cardiovascular disease, reduces the risk of thrombosis, protects the liver, regulates glucose levels, and controls rheumatoid arthritis. Regular consumption of green tea also prevents tooth decay, avoids food poisoning, and assists in weight loss (increases fat oxidation). Plus, it protects the brain cells from dying and restores damaged brain cells. Therefore, having green tea helps delay the deterioration related to Alzheimer’s and Parkinson’s disease. Moreover, it has been found that green tea inhibits the growth of cancer cells. On the downside, though, it may cause insomnia because it contains caffeine. Rosehip: It is prepared from crushed rose hips. The tea has a mild flavor and it works as an effective therapy for preventing and alleviating cold and flu. Rosehip tea also helps in dealing with asthma, bronchitis, allergies, cardiovascular disease, urinary tract infections, water retention, dizziness, stress, rheumatism, and so on. It ensures vitality and assists in hormone regulation, too. Valerian: It works as a natural sedative and mild tranquilizer. Thus, it serves as an efficient herbal remedy for headache, insomnia, palpitations, anxiety, hypertension, menstrual cramps, etc. Another advantage of having valerian tea is that you are not likely to get addicted to it. Cinnamon: Cinnamon is brilliant for those who are suffering from diabetes because it improves the ability of insulin to metabolize sugar. In addition, it works as an appetite stimulant and cures gastrointestinal problems like intestinal gas, flatulence and abdominal discomfort. Nettle: Nettle tea is prepared from stinging nettle plant. It can be used to stimulate appetite, repair broken nails, protect against hair loss, reduce water retention, ease muscle spasms, fight respiratory problems, increase fertility, deal with allergies (hay fever), and treat liver, spleen and intestinal disorders. As this beverage is high in calcium, you can drink nettle tea to heal muscle and joint diseases. Liquorice: It is useful for the treatment of asthma, cough, bronchial congestion, peptic ulcers, canker sores, stomach pain, acid reflux, obesity, and viral infections. This herbal infusion is particularly good for those who are trying to quit smoking. As the herb has an estrogen-like compound, it reduces symptoms associated with PMS, menopause, and polycystic ovary syndrome. On the downside, prolonged consumption of this tea can lead to minor edema and high blood pressure (it causes the body to hold sodium). Elderflower: It purifies blood and freckles and skin blemishes. Plus, it builds the immune system, promotes perspiration, increases urination, relieves the symptoms of allergies (due to pollen), treats respiratory problems, reduces fungal infections, and improves liver function. Fennel: It soothes upper respiratory problems and promotes digestion by relaxing the muscle lining the gastrointestinal tract. Calendula: This tea is particularly good for individuals dealing with gastrointestinal disorders such as peptic ulcers and gastritis. It detoxifies the body, protects the liver, treats viral infections, and fights aging. In addition, it helps regulate menstrual cycle and relieve menopausal discomfort in women. You can also use it as an eye wash to heal conjunctivitis. Moreover, gargling with the infusion relieves sore throat and mouth inflammations. It is suggested to avoid drinking more than three cups of this herbal tea in a day. Catnip: This relaxing herb has mild diaphoretic, carminative, decongestant, disinfectant, and sedative qualities. It can help reduce menstrual cramps, migraines, and arthritis pains. Plus, it can provide relief from digestive disorders, reduce fever through sweating, ease nervousness, and soothe stress, especially in case of drug withdrawal. Its strong aroma may also repel bugs. Hibiscus flower: This tasty and refreshing beverage is beneficial for mildly hypertensive adults as it helps lower blood pressure. In addition, it lowers LDL cholesterol, combats heart disease, treats liver problems, and enhances immunity. Being rich in antioxidants, it eliminates free radicals and helps maintain good health. You can enjoy it as both hot as well as iced tea. Yarrow: Works as a great health tonic by stimulating appetite, boosting the immune system, increasing perspiration, and aiding in detoxification. In addition, it promotes bile flow to the gall bladder, relieves menstrual cramps, and facilitates blood clotting (prevents hemorrhage). You can drink this herbal tea before going to bed to induce relaxation and deep sleep. Due to its strong cleansing properties, though, yarrow tea should not be consumed too often. Skullcap: This calming tea helps improve the functioning of the nervous system. It relieves exhaustion, nervous tension, headache, muscle spasm, premenstrual syndrome, hepatitis, epilepsy, hangover, and withdrawal symptoms that appear when trying to quit alcohol or nicotine. It promotes menstruation. Lemongrass: It works as an excellent detoxifying agent and promotes good sleep. Plus, it aids in digestion, lowers blood pressure, keeps cholesterol levels normal, and heals anxiety and depression. Besides, you can apply the infusion on skin to clear pimples and skin blemishes. St John’s Wort: This is a cool, mild, and bitter herb with sedative, anti-depressant, astringent properties. Thus, it is useful in the treatment of insomnia, anxiety, depression, neurosis, seasonal affective disorder, and stress. Moreover, it helps control issues like bedwetting, gout, rheumatoid arthritis, sciatica, etc. Some other common ingredients in most herbal tea preparations are anise seeds (freshens your breath and improves bronchitis), chrysanthemum (neutralizes toxins), ginseng (promotes vitality), hoodia gordonii (facilitates weight loss), hawthorn (strengthens the heart), sarsaparilla (promotes energy), and so on. While taking herbal remedies, though, make sure you consult with your doctor beforehand because certain herbs may interfere with some prescription drugs and reduce their efficiency. Furthermore, some of the above-mentioned herbs may not be suitable during pregnancy.